Once your herbs are settled in and growing there are a few tips that you can use to keep your garden strong and producing lush herbs for your dinners and deserts!! So, for our last installment of Bloom's Herban Gardening Series I'll give you all the insider tips for how to keep up with the care of your new garden!! - Firstly, herbs must be watered regularly. How much or how little depends on the types of herbs you've chosen to grow so research each herb throughly to make sure you are giving your growing plants the water they need! Also, potted herbs need a bit more water than their outdoor counterparts because they tend to dry out faster! And of course you're herbs will need more water when it's hot a dry than when the temperatures are cool and rainy... so come summer get a water canister ready for their daily hydration!! -Weeding your outdoor herbs is an important part of their caring for them. It's easiest to check for weeds once a weeks so you can catch, and remove them, when they're small! There are a plethora of reasons you'll want to keep weeds out of your garden, from competition for water to attraction of bugs, so be sure you keep up with this easy tip!! -Be sure to prune, prune, prune!! Do not take the big, tough leaves off the bottom, they act like solar power that energizes the growth of the whole plant. Instead, prune off the top. When your herb starts to get too tall, cut off the growth above the last set of leaves. This will allow two new growth points for your herb. Keep up with this once a month and help your herbs grow into robust and happy plants!! -Luckily herbs don't need much fertilization, but for a heathy boost use an organic liquid fertilizer once or twice during the growing season and you'll see a notable difference!! 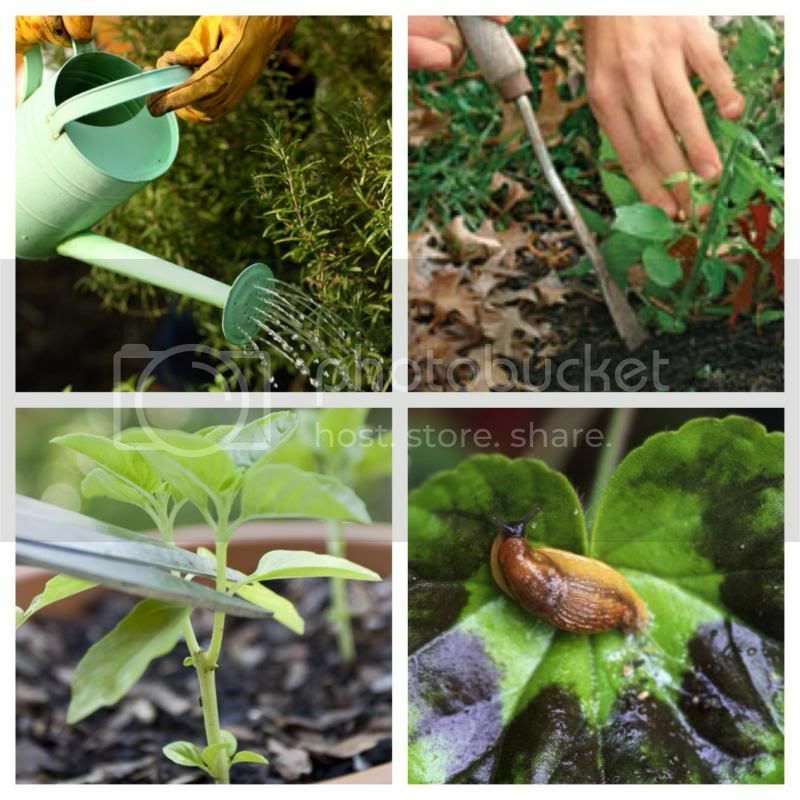 -Now your outdoor herbs may encounter a few new uninvited guests to their garden, not to worry there are a few things you can do to naturally keeps them at bay. Be sure to remove any dead or sickly looking leaves that may have already been attacked by insects, keeping plants healthy to begin with is the best prevention. Also, to keep sluggish bugs away place crushed egg shells around the base of your herbs which will not feel so great on their slimy little bodies. Lastly, include some VIP guests like ladybugs or toads to your garden which are natural predators of plant lice and slugs!! -Lastly, earthworms are always a good option! Let them roam freely in your garden and they'll give you an air circulated, well watered and strongly rooted garden! !